Why and how do researchers collaborate, share knowledge resources, data, and expertise? What kinds of infrastructures and services do they use, and what do they need for the future enhancement of collaborative research practices? The chapter focuses on existing and potential eResearch from a “user” perspective. 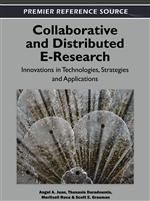 Drawing on a study of ICT-enhanced research practices and needs conducted at seven Australian universities, it discusses how researchers engage with distributed research and use ICT for collaboration. Findings show significant current engagement of the majority of researchers in collaborative research, their acknowledgement of the potential of eResearch, and researchers’ general willingness to engage in collaborative eResearch. While there are some essential differences in the collaboration practices of research students and academics and between practices and challenges in different disciplinary domains, researchers who are more involved in collaborative research also adopt eResearch more extensively, more often use ICT-enhanced collaboration tools, share more of their data, and more often disseminate their findings via digital media. National and international research agendas almost universally acknowledge that successful solutions of global issues and future social, cultural, and scientific innovation fundamentally rely on distributed scholarly practices and research collaborations, such as the sharing and integration of data, resources and knowledge, remote collaborative access to scientific instruments, and pooled human expertise (Atkins, et al., 2003; Hey, Tansley, & Tolle, 2009). Many countries, including Australia, have made significant strategic investments in developing general and discipline-specific data repositories, virtual laboratories and other shared technology-enhanced research infrastructures often known under several broad umbrella terms, such as ‘eResearch,’ ‘Cyberinfrastructure,’ ‘eInfrastructure,’ ‘eScience,’ ‘eHumanities,’ ‘eSocial Sciences,’ and ‘The Grid’ (ACLS, 2006; Atkins, et al., 2003; DEST, 2006; http://www.e-irg.eu/images, 2009; NCRIS Committee, 2008). Some pioneering collaborative research projects have demonstrated successful uptake of new research infrastructures and significant benefits of collaborative research practices (e.g., see Hey, et al., 2009). However, experiences from some other technology-enhanced collaborative projects have suggested that researchers involved in such collaborative research also face a range of challenges, and such research collaborations have not been as successful as it was initially expected (Borgman, 2007; Haythornthwaite, et al., 2006; Lawrence, 2006; Meyer, 2009). Further, the uptake of collaborative research practices and new infrastructures beyond pilot projects tend to be slower and less transformative than initially planned (Foster & Gibbons, 2005). Among key questions for further development of eResearch are the widening adoption of technology-enhanced research practices and the sustainability of ‘proof-to-concept’ developed eResearch tools and services (Halfpenny, et al., 2009). eResearch infrastructure developers face significant challenges and tensions in meeting current researcher demands and simultaneously creating infrastructure for the desired future (Ribes & Finholt, 2009). On the one hand, effective technological infrastructures for data sharing, communication, remote data analysis, and other distributed research tasks are important enablers of collaborative discovery and innovation. On the other hand, many barriers for collaborative research tend to be not technological, but rather social, cultural and organizational, such as lack of researchers’ willingness and engagement, difficulties managing information, ethical concerns, and legal issues (David, 2006; Haythornthwaite, et al., 2006; Jirotka, et al., 2005; Lawrence, 2006). Further, researchers’ scientific challenges, their ways of doing collaborative research and their needs for eResearch infrastructures and support vary considerably within and across disciplines and research fields (Bos, et al., 2007; Fry, 2006; Laterza, Carmichael, & Procter, 2007). In order to create infrastructures and services that meet researchers’ expectations and epistemic practices now and in the future, eResearch implementers and funders need initially to understand existing research questions, current challenges and practices, and future research visions. Why and how do researchers collaborate, share knowledge, resources, and expertise? What encourages researchers and what prevents them from engaging in collaborative eResearch practices? What kind of infrastructures, services and support do they need? How do they envision collaborative eResearch in the future of their field?